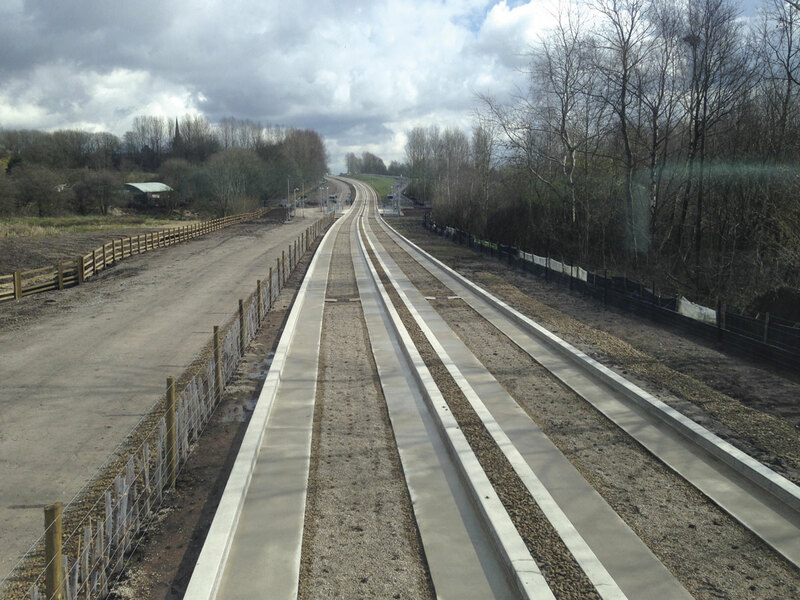 Manchester’s guided busway is now open for business. With the vast majority of the construction programme complete, services on the route began operating last Sunday (3 April). Prior to the first day of operation, a launch event was held which Chris Peat attended. 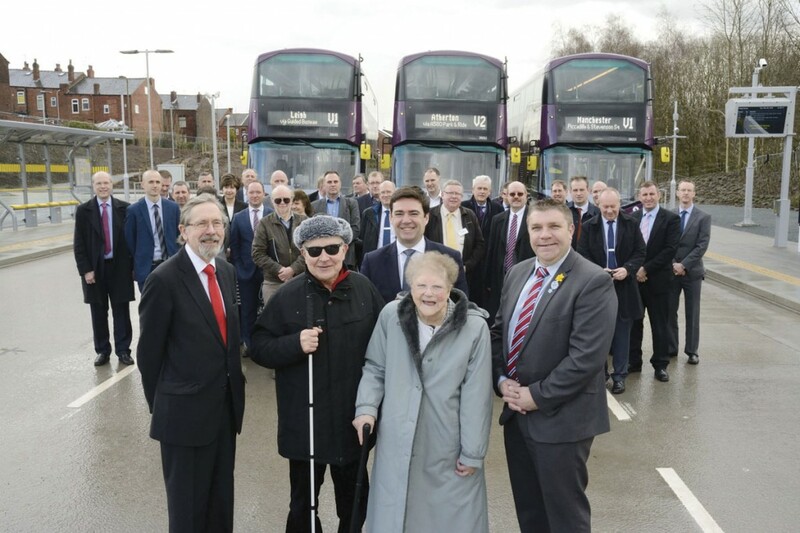 The project is designed to enable people to enjoy faster, more punctual and more reliable bus services to and through Manchester city centre from towns to the west. 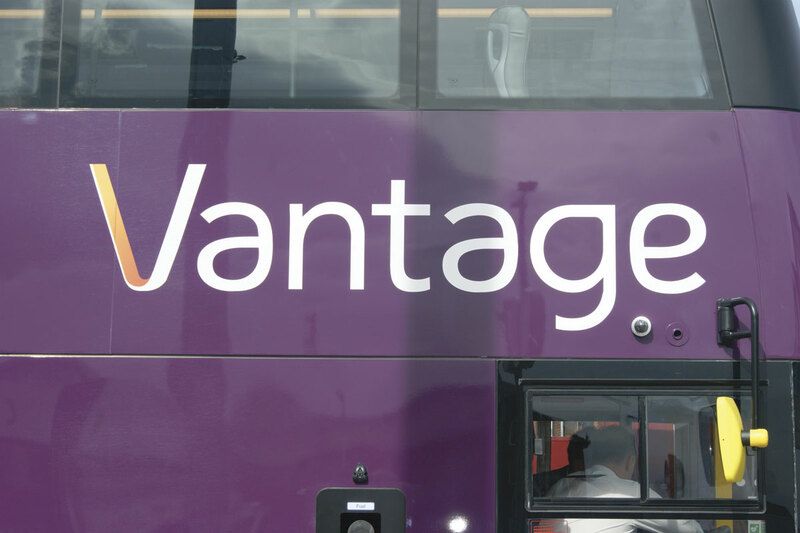 Buses on the new Vantage branded services complete the 14 mile route between Leigh, Atherton, Tyldesley, Salford and Manchester in as little as 50 minutes. Passengers travelling between Leigh and Manchester previously faced journeys timetabled at up to one hour and 20 minutes. 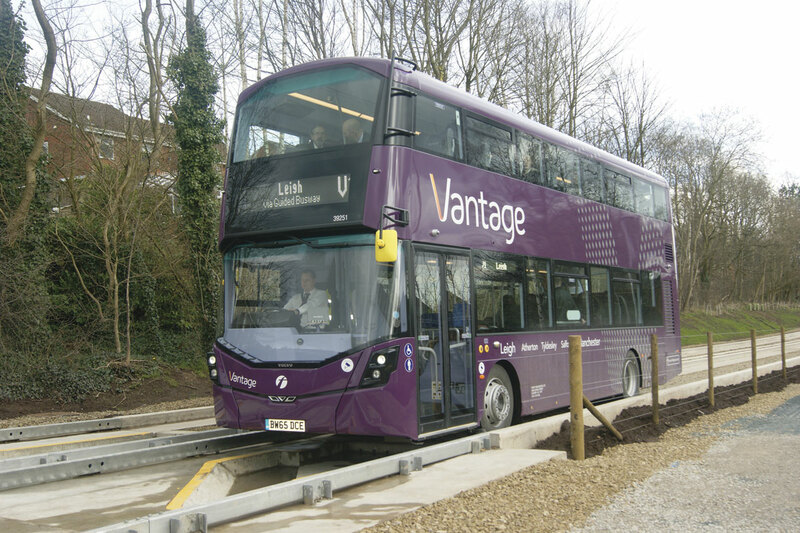 At the core of the Vantage services is the guided busway itself which stretches 4.5 miles between Leigh, Tyldesley and Ellenbrook. It forms the flagship element of Transport for Greater Manchester’s (TfGM) bus priority investment, a £122m overall package. £68m of this was spent on the guided busway itself, including the track and associated infrastructure. The remaining £54m was spent on upgrades to the local roads that the new services on the busway will also traverse. The DfT provided £32.5m of the funding required for the scheme, with the rest coming from the Greater Manchester Transport Fund, controlled by representatives of ten of the region’s councils. The busway belongs to and is maintained by TfGM. The busway links to bus priority routes along the A580 through Salford, with the remaining bus priority work currently taking place to the south of Manchester city centre along Oxford Road. The city centre works are themselves part of a £1bn investment designed to ‘future proof’ the transport network and support the regional economy. With a PVR of 19, the frequency is four buses per hour from Leigh (V1) and four buses per hour from Atherton (V2) giving eight buses per hour from the point V1 and V2 are combined between Tyldesley and Manchester. Therefore, the high frequency service normally provides buses better than every ten minutes over the common section of the route during the day and every 15 minutes in the evenings and on Sundays. Busway services will start as early as 04.00 and run beyond midnight. 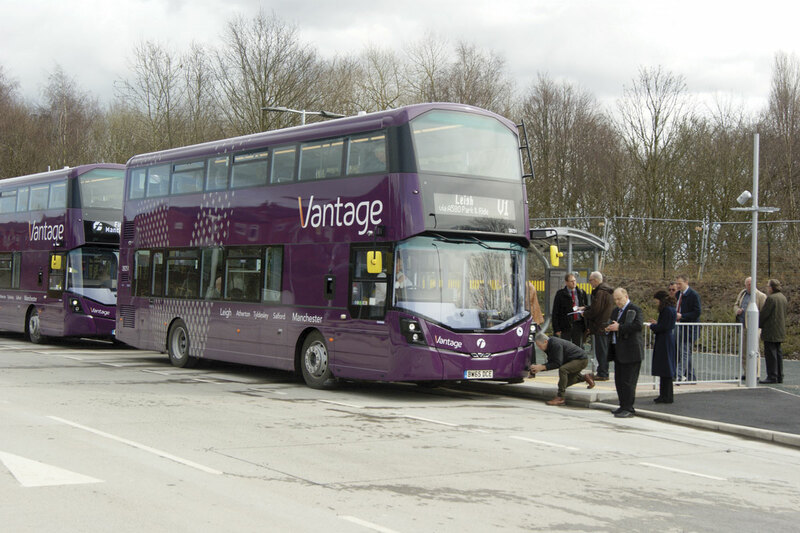 Operated by First Manchester under the Vantage brand, a fleet of 20 new and bespoke Volvo B5LH hybrids with Wrightbus Gemini 3 bodywork are used on it. Costing £350,000 each, they were purchased with help from the DfT’s Green Bus Fund. Running from First Manchester’s Bolton depot, they are powered by the Volvo D5K four-cylinder, common-rail 5.1litre Euro6 engines with overhead camshaft, SCR, EGR, DPF and DOC. They are specified with the Volvo I-Shift AT2412E fully automated manual gearboxes. ‘Driving them is a nice experience’, said First driver, Dave Halt. He was also impressed with how quiet the hybrids run. The purple livery makes the vehicles stand out from the rest of First’s fleet in the area. The buses have ‘v’ motifs and the ‘Vantage’ name clearly displayed on all four sides. The livery and branding was designed by the operator’s marketing team with help from Sheffield based marketing agency, Jaywing, with the application work taken care of by Aura Graphics. Inside the double deckers, the premium styling continues, with wood effect laminate flooring throughout and high backed seats. There are 37 Esteban EGA seats on the upper deck, whilst the lower deck has 26 Esteban Civic V3s. 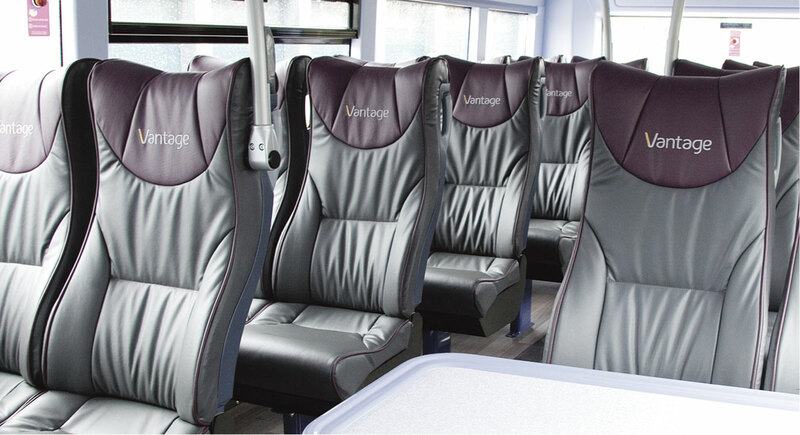 All are upholstered in E-leather in a ‘grey and aubergine’ colour bespoke to First’s requirements. Vantage logos have been embroidered into the seats as a finishing touch and tables are installed on the upper deck. 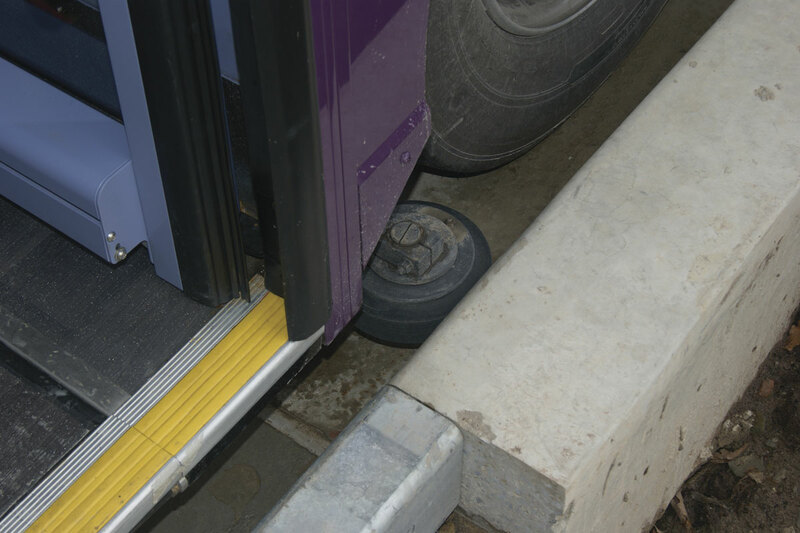 Each bus is equipped with guide-arms which engage with the upstands of the busway channels. Audio and visual stop announcements, vehicle location and real time information for the buses are taken care of by an Intelligent Data Router from Trapeze. The fully climate controlled vehicles have Hanover destination displays, a 21st Century 14 camera CCTV system and Metric ticket machines. The Optima BL ticketing units feature a colour display screen, a card processor, an integrated onboard computer and a Wi-Fi antenna. The specification also includes Icomera Wi-Fi units and USB charging points. 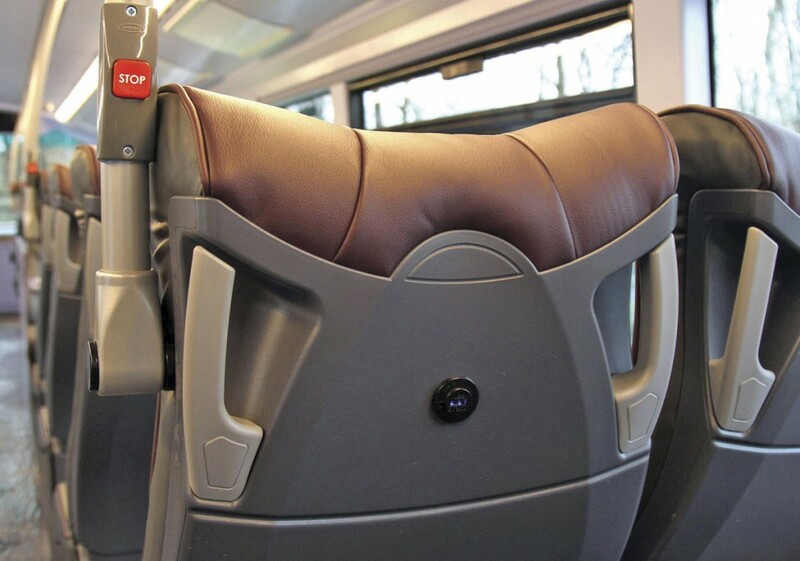 National Accounts Manager at Wrightbus, John Hartley, said such equipment is being increasingly fitted onboard the manufacturer’s vehicles these days. Interest in hybrids is also starting to rise, he claims, especially as advances in the technology mean the cost of them is lowering. He believes the decision of whether to opt for hybrids is often driven by commercial aspects. As such, support from local authorities for these types of vehicles is key, he says. It is not just vehicles that have been invested in. The seven purpose-built stops along the busway all have real time passenger information display boards, CCTV, a public address system and covered cycle parking. The investment includes three new park and ride facilities catering for more than 400 cars in total, as well as a specially surfaced shared path alongside the busway that can be used by walkers, cyclists and horse riders. At the time of the launch this had not all been completed, with some minor building work taking place. Following the award of the contract, First Manchester worked closely with TfGM on the development of the busway. The contract includes the requirement to offer a £1 fare for journeys on the guideway section of the route and for the buses to be kept as clean as possible, which Business Manager at First Manchester, Matt Rawlinson, said is something it always works to ensure anyway. It has to fulfil the mileage it says it will and high customer satisfaction has to be achieved. A 98% reliability standard has been set up. Extra attention has also been given to the drivers, who have all received familiarisation training with the vehicles and the busway. This is in addition to classroom training to enhance their customer relation skills. Matt said that because it is a bespoke service, staff were ‘itching to be a driver for it’. The Bolton depot has employed more drivers to cover the additional requirements generated by these routes. The design of the buses for the busway was guided by a public consultation event. TfGM was also consulted, as was the Disability Design Reference Group as it is important they are designed to be as accessible as possible. The ‘real difference’ on the Vantage fleet compared to the rest of the operator’s buses in the area is the upstairs section with tables. Head of External Relations UK Bus (Yorkshire and Greater Manchester), Brandon Jones, said the company has nothing like them anywhere else in the north west or Yorkshire. Both Brandon and Matt believe the coach style seats will go down well with passengers. Running the busway sees First Manchester enter some ‘new territory’, according to Matt, running in areas that have not previously had a high frequency bus service. He said that hopefully this will attract a lot of new customers. It also runs close to a railway station, which is another advantage, with Matt saying, ‘Hopefully it will become commuters’ first option.’ He believes it is going to attract a lot of people travelling in the local area, simply because it is such a high frequency service and the fact it provides a direct link. Introducing the busway V1 and V2 services means some alterations were put in place elsewhere on First Manchester’s network. Changes were made to its 8, 22, 36, 37, 501, 507, 511, 519/520, 575, 582 and X39. Services have been withdrawn on the 12, 25, 39N and X34 where the busway services make them redundant. Head of Commercial at First Manchester, Ian Humphreys, said the changes have helped ‘segment’ its services, creating what he describes as a ‘better local bus’. The changes are designed to ‘offer the right product for the right people’. His expectation is that it will give people the perception that they can get so much closer in such a short space of time. He said he had heard some people at the launch say, ‘I didn’t realise we were here already’. Commenting on patronage in the area, Ian believes it is already relatively strong. 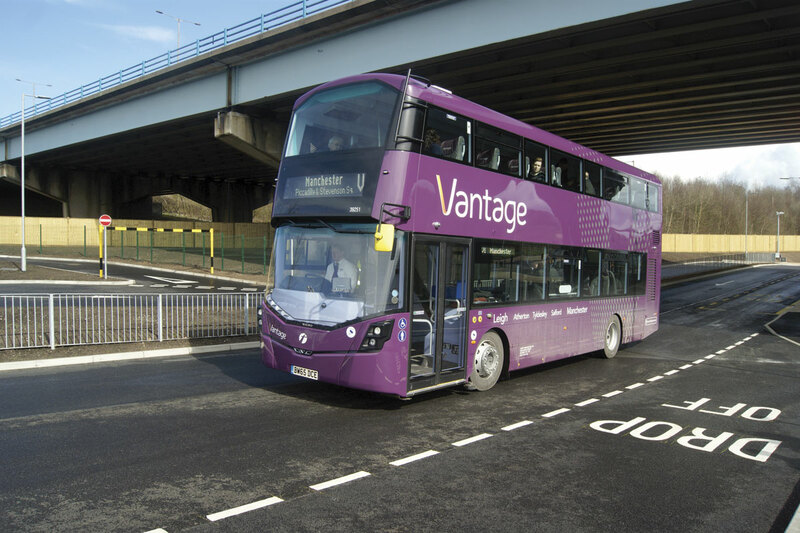 First Manchester introduced a route between Leigh and Bolton using the former Kickstart government funding delivering increasing levels of use that ‘grew from nothing’. The busway tracks the services run on are particularly noteworthy. In an effort to achieve a much smoother ride, Balfour Beatty used slip forming, a building technique which had not previously been used for busway tracks, according to Operations Director for Balfour Beatty, Drag Barnett. Traditionally, busway tracks have been laid in sections, with the joints between each one causing a slight judder when a bus goes over it. Manchester’s busway is one continuously reinforced concrete track with no joints in its stretch, with Drag explaining it as ‘seamless’. To meet the construction standards set by TfGM, the track’s upstands had to be made to within a 1mm tolerance allowance. Because concrete cannot be made to such exact measurements, they were cast and then diamond tip grinding techniques and laser measurement were used to get them to the right size on site. The bespoke grinding solution was developed by slipforming specialist, Extrudakerb. One of the advantages of this build method is it can better deal with differential ground subsidence, it is also quicker to build. Drag said Balfour Beatty set up a concrete batching facility at East Bond Street in Leigh, shipping it to the point of construction using the busway itself. TfGM defined the tolerances and specifications, the contractor developing its own construction process. Drag said his company looked at the lessons learnt from other similar constructions when building it. 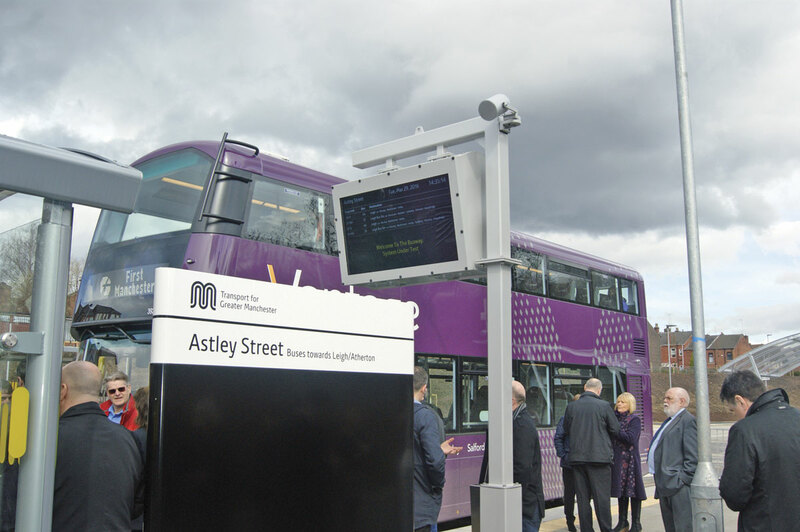 Balfour Beatty teamed up with Atkins, the designers of the Cambridgeshire and Luton busways, to design the Manchester project. Preparation for the slipformed guided busway started in January 2015 with the area surrounding the tracks cleared in preparation for the building to take place. This was followed by the building of a trial section of the track in March. After a successful test, construction of the busway took place and was completed by the end of August. It could not be opened to the public by then though as overall construction had not been completed, with a lot of infrastructure that needed to be put in place. Making the building task even more challenging was the constrained building space. In some places it required the builders to work in peoples’ back gardens. A number of best practice policies were put in place by Balfour Beatty, which enabled it to avoid 11,130 wagon movements through optimised material use. There was 83,500 cubic metres of material diverted from landfill through value engineering. Drag said Balfour Beatty tried to follow the existing topography of the ground. It also worked with the Forestry Commission to create communal woodland using 72,000 tonnes of material that would have otherwise have had to be taken off site. ‘Quite a lot of robust checking’ was made to ensure the materials used in these leafy sections would sustain growth. In all, 25,000 trees were planted. Drainage measures were taken to ensure the busway and surrounding area stays useable and safe. There are a number of underground retainer tanks, which are designed to release only the correct amount of water that the area surrounding the tracks can deal with. ‘Quite an extensive’ soft landscaping design was put in place, with around 100,000 shrubs planted to complement the trees. It wasn’t only flora that was considered during the build, the local fauna was catered for as well. For instance, an ‘amphibian crossing’ was put in place. This underground tunnel allows such endangered species as the Greater Crested Newt that live in the area to traverse the tracks safely. Over 200 of these creatures were moved under licence along with 3,000 other amphibians to new pools specially created for them. Although it currently looks rather bare in places, the busway is intended to be much greener once the fauna begins to grow. Chair of the TfGM Committee, Cllr Andrew Fender, described the busway as a ‘linear park’ with walkways and cycle paths to the side of it. It may well be understandable for him to sound so pleased when you consider how long it has been in the making. The idea for it originally surfaced in the late 90s but only recently has the scheme to use the old railway line as a busway been financially achievable.